Quickly heat water for instant coffee and soups, tea or hot cocoa, rice or pasta, blanching vegetables, instant oatmeal or gelatin with this stylish electric kettle. The concealed heating element is contained in the stainless steel base with built-in cord storage. 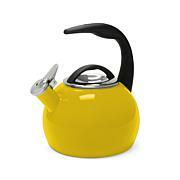 Just detach the kettle from the base for easy serving. Really like this kettle. 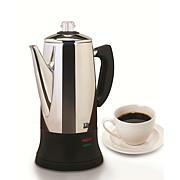 I bought it to quickly heat up water for tea and coffee press. Works great. Heats up very quick. I like how the lid handle can be popped down to keep it on while pouring. So much easier than heating on the stove and getting water everywhere when pouring. Would buy again! Love it because its clear and I can see inside to confirm its clean. 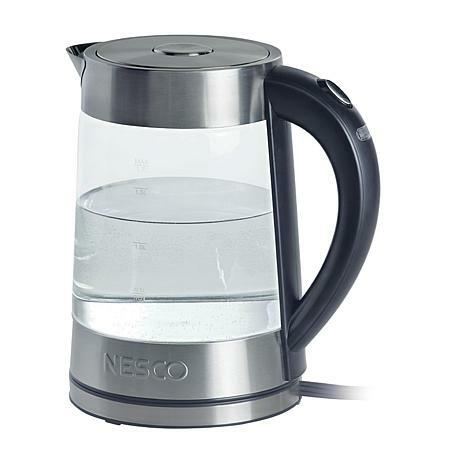 Nesco makes good products this included. I found water boiled faster than on the stove. The auto shut off feature is a plus. I nice addition to my kitchen. 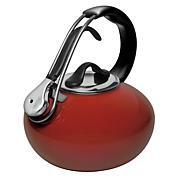 I simply love this water kettle. It came in handy when a few of my kids got sick and I could "quickly" make them some tea or chicken broth.It heats the water rather quickly and it will automatically turn itself off when done. 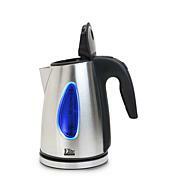 Easy to clean and to store away.I really do enjoy this water kettle! Heats water very quickly. Great appearance.